A small, broadly pyramidal, dense tree with dark green, fine textured foliage that turns yellow in fall. 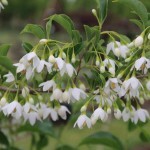 Beautiful late spring flowers are pure white and bell shaped. They dangle below the branches. It has more uniform growth habit and better twig dieback resistance than seedling grown trees. It grows best in an acidic, organically rich, well-drained soil in full sun to part shade.